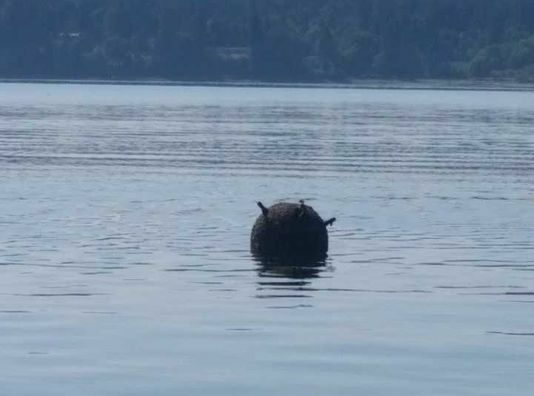 After further investigation, the Navy concluded the errant mine was actually an inert training shape designed to look like a mine that was used during an exercise hosted by the Naval Undersea Warfare Center-Keyport in 2005. The Navy stated that the shape did not contain any explosive or energetic material. In the summer of 2005, Keyport hosted the annual Autonomous Underwater Vehicle Fest, which brought a number of Navy Commands, industry partners and academics together to test how well their undersea vehicles could detect underwater objects. The shape was one of four floating mine-like objects used in the exercise, anchored 6 feet above the seabed. However, after almost a decade and a half of resting near the seafloor, that particular object no longer bared the visible markings of being a training device, making it difficult to initially decide if the mine was some sort of long-lost military relic dredged up from the depths. Reportedly, the Navy placed 25 other "negatively buoyant" objects across four different training minefields in the same area, many of which are still resting on the seafloor today. Ms. Wendy Miles, a spokesperson for Naval Undersea Warfare Center-Keyport stated - "They're still there, but they don't pose a risk. Those items, as well as the mine discovered this week, were left in place in the water for use in subsequent exercises and they will continue to be used for training in the future." Although the item was inert, in a press release issued by the Navy, they stated that "out of an abundance of caution" the Navy's Bangor-based EOD team towed the item north into more open water near Keyport where it was safely detonated.